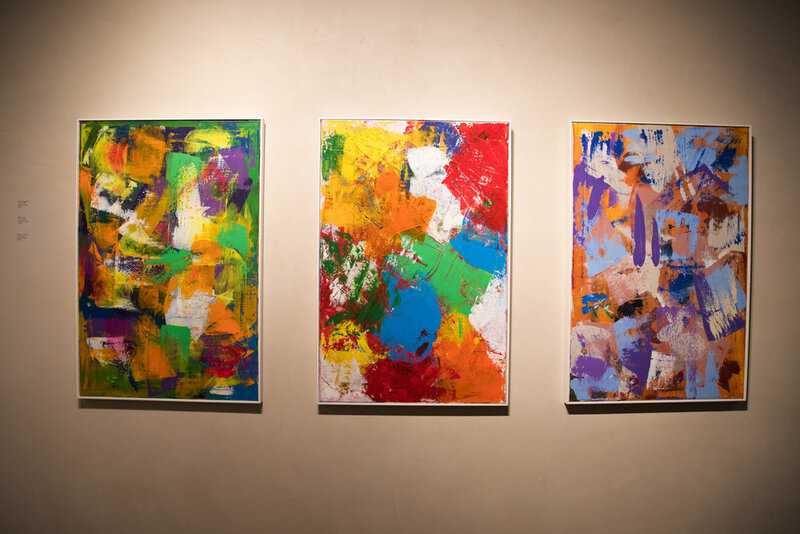 Rancho Mirage, California-based artist, Nicholas Kontaxis visited the Mountain West this summer on a tour, and those unfamiliar with his work were stunned by the color and vivacity of his paintings. Kontaxis is no ordinary artist and his work is proof of that. At just 21 years of age, Southern California artist Kontaxis has been overcoming more day-to-day hardships than the average person will confront in an entire lifetime. Diagnosed with a brain tumor at 15 years old, Kontaxis suffers from intractable seizures, autism, and developmental delay. The seizures happen at least five times a day. Early on, his family made a decision to treat the seizures by keeping him active and not overly medicated. This approach has led to an unexpected career in painting. When Kontaxis paints, the way he sees the world comes through unfiltered and unimpeded by his physical and mental differences. He paints in the style of pure abstraction with the use of bright, vivid color choices. 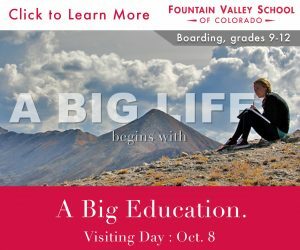 Compositions are usually a series of quick brushstrokes that are closely connected in a bold color scheme with elements that harmonize and give the viewer a sense of positive energy. “He’s expressionistic,” says Krisann. “Nick is not a drawer. He doesn’t have the ability to create realistic landscapes or figures. He takes paint and he moves it. 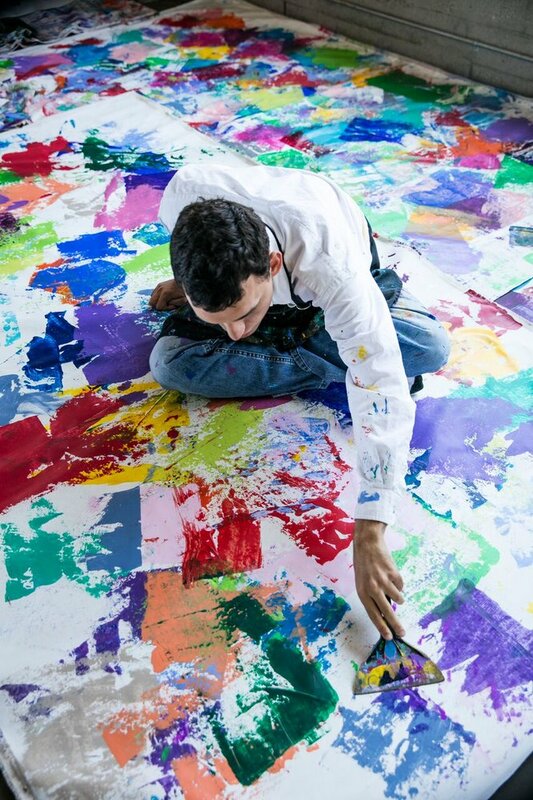 In a class when other kids were doing lines and drawing, he was working on painting.” Kontaxis has created over 90 large-scale pieces using acrylic paints and a palette knife. The results of this approach to painting are a sight to behold and have resulted in unexpected acclaim from the art world and the general public. Because of his condition, Kontaxis struggled to function in several entry-level job opportunities. Krisann began to wonder if becoming a professional artist was actually an option. In the beginning, she was met with all kinds of skepticism that her son’s paintings would never be able to be sold. But after some of his early paintings were framed and put on the market, they realized there was no room for such negativity. Krisann explains how Kontaxis’ work took off like wildfire from there, “After all of the first paintings that were put on the market sold so quickly I contacted my sister who knows a lot of designers in L.A. She told me that Nick should start doing paintings on much bigger canvases. Those also started to sell really well. Suddenly we had a show in L.A. with 250 people RSVPing and 850 people showing up. Soon, some paintings were being sold to big-time collectors such as the head of YouTube and the owner of the L.A. Chargers.” Sure, Krisann is a proud mom, but who wouldn’t be considering what Kontaxis has been up against. Krisann isn’t fueld so much by pride as she is by unfiltered joy that her son has found his way in the world. Krisann tells us that Kontaxis can’t converse easily, especially at showings where there are a lot of unfamiliar people. But, often, the title of each painting tells his story and gives insight into his playful character. “We put all of the words that come out of his mouth on a long list,” his mother explains. “The other day he said ‘exit means stop.’ And that could be a title for a possible painting someday. One time he said ‘Shimmy shimmy wow,’ and we wrote that on the back of a painting. If someone asks him to say something he won’t. But during the day when the seizures ebb and flow, he can be more verbal at certain moments. What he says changes as the seizures change and you never know what you’re going to get.” The titles of his works are certainly catchy and refreshing—“I See You Sitting Up There,” “I’m Great Too,” “Let Your Hair Down,” “Pink Weeds,” “Good Music,” and “Do You Have A Question.” They often help to create an even greater sense of playfulness to the vibrant color schemes of the paintings. Having daily seizures also affects the physical mechanism of painting. “Some days he has a lot of energy and he’ll paint standing up with a lot of fluidity,” says Krisann. “And sometimes he has to stay on the ground and paint large canvases sitting down. His paintings change with his illness as well. 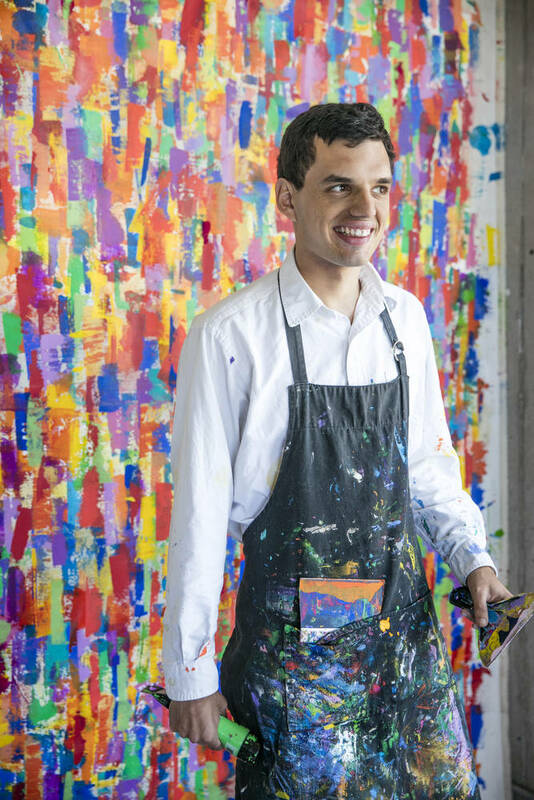 The incredible thing that means the most to all of us is that people are liking his paintings because of his imperfections.” The act of free-form painting can be therapeutic for those who suffer from autism. While many people can get tired of the constant repetitions, someone with this condition has the ability to fully immerse themselves in it. Krisann was recently given one piece of advice from a prominent dealer associated with the famous Art Basel event: make sure he paints every single day. And that is one thing that you can be guaranteed that Kontaxis will do. He loves it. This past August the Gilman Contemporary gallery in Ketchum, Idaho, hosted an evening showing of the latest paintings by Kontaxis. 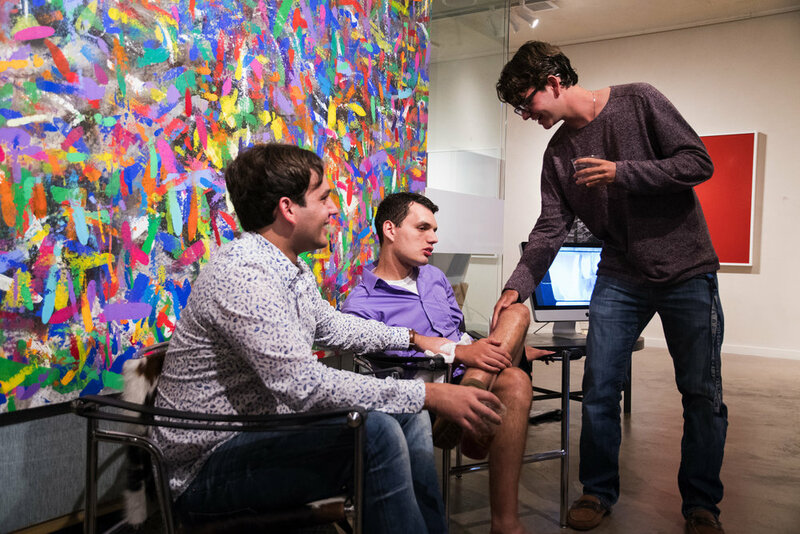 As the crowd enjoyed the vividly colorful abstract works lining the walls, Kontaxis sat with his two older brothers and often had a bright smile on his face. Even though he was in a situation that can often make him uncomfortable, he seemed to soak it up.